Prezi is the presentation platform that helps you connect more powerfully with your audience. Unlike slides, Prezi's interactive, zoomable canvas lets you show relationships between the big picture and fine details, putting your ideas in context. Your message is more likely to resonate, motivate, and be remembered. Founded in 2009, and with offices in San Francisco and Budapest, Prezi now fosters a community of over 50 million users and over 160 million prezis around the world. With investors including Accel Partners, Spectrum Equity, and TED Conferences, Prezi is in the business of making presenters great. One of the greatest innovations in education was the blackboard. For the first time in history, teachers could present their lessons visually and engage students to participate in the conversation. The whiteboard has done the same for business, helping us to explore and share ideas more effectively. 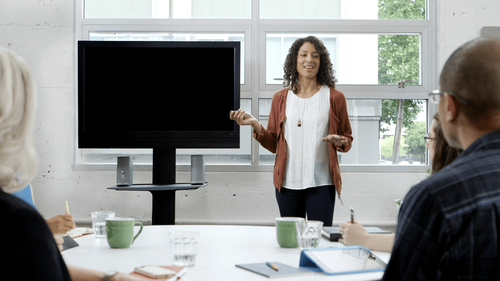 Prezi is a virtual whiteboard that transforms presentations from monologues into conversations: enabling people to see, understand, and remember ideas. By year-over-year growth, over 250 million Prezis are viewed online, over a million new users a month and more than one prezi created every second. Take advantage of enhanced image editing tools and work offline support. Prezi Online—The zooming presentation software that lets presenters choose between the freedom of the cloud, the security of the desktop, or the mobility of the iPad or iPhone. 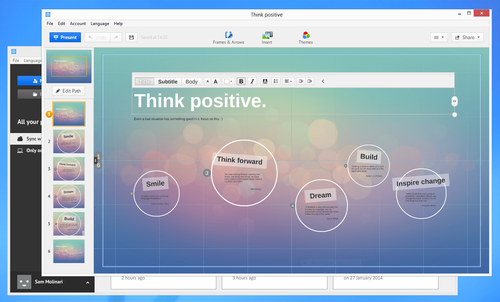 Prezi Desktop—Gives presenters all the power of Prezi without needing an Internet connection. 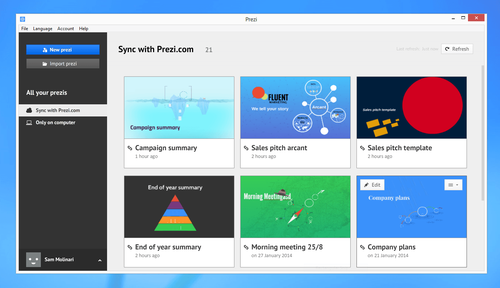 Prezi Meeting—Brainstorm, create, and present ideas in one shared virtual whiteboard. 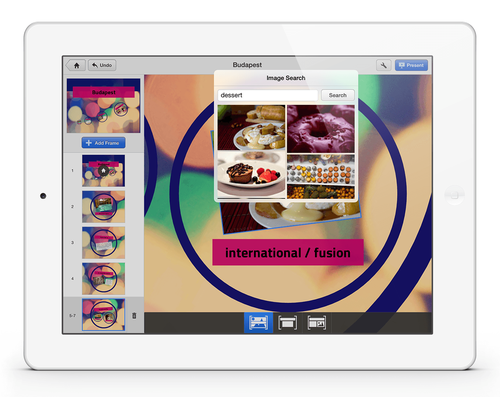 Prezi for iPad/iPhone—Accessible for the world’s most famous mobile electronic devices anywhere. 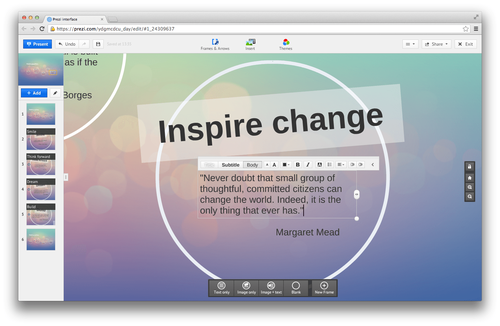 Prezi is an innovative web based presentation tool based on an infinite canvas. Text, images and videos can be displayed on the canvas and can be structured by frames. A path in the prezi sets the storyline of the presentation. The power of Prezi is the infinite canvas and the zooming features. Zooming out provides overview, zooming in provides details. This transfer of knowledge is more appropriate for the way our brain processes and holds on to information. With Prezi you can create online presentations. In fact, a Prezi presentation (in short: a prezi) consists of a large piece of paper (a canvas) to build your presentation on. You can put text, images and videos on the canvas. It is quite easy to increase or reduce the size of those pieces of information, as well as moving or rotating them. This is done in Prezi using the Transformation Tool. This is an ingenious, intuitive tool allowing you to work fast. Important subjects in your presentation can be shown large and details can be shown small. Then you can zoom in and out. By zooming out you provide overview and by zooming in you can show specific information. You can use a prezi online, but you can also download the presentation and use it offline. So you do not depend on the internet when you do a presentation. 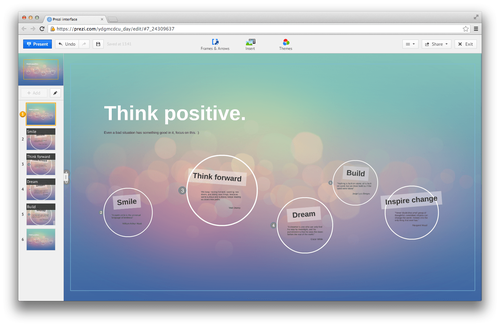 As Prezi’s basic principle is an infinitely large canvas you can compare it to a mind map. Therefore you can create much more creative and effective presentations. By adding a path you can tell your story. You can set up this path before your presentation and follow it during your presentation, but you do not have to. You can also zoom in on different subjects of your presentation and zoom out when overview is needed. Prezi is not just some new tool to create presentations. Prezi is called the PowerPoint-killer, and for a good reason. PowerPoint uses slides, while Prezi uses the infinite canvas. The disadvantage of a slide is for the audience not getting an overview of your message. Prezi provides this. If you provide your audience with overview, the audience keeps track of your presentation. This provides clarity and your audience will enjoy that. The audience wants to know what is next, what you are discussing at that point and what subjects are still to come. Not knowing this might awake an unsatisfied and restless feeling. This mindmap is obviously an undesirable situation while presenting! When using slides you deprive your audience from overview, disabling them to see the links between the different subjects. A slideshow makes it more difficult to separate main and side issues. By placing all the information on one canvas, you provide your audience with spatial awareness and this is a major help for knowledge sharing. With Prezi you can visualize the structure of the information, and this supports your audience to memorize what you are trying to convey. Prezi supports your message and not the other way around. We tend to compare the use of Prezi to looking at a painting. When you look at all the tiny details separately you do not get a complete image of the painting, no overview. But when you look at a painting from a distance, you tend to miss out on the details quite easily. Only when you can look at the painting from a distance and you are able to get close to the painting, you get a complete image of the painting.